Newest & Coolest - Create with Craft Fantastic! If you love Craft Fantastic, you will love this workshop! Relax and create after a fun filled day of making and shopping at the Expo. Play with over $60 worth of the latest and greatest products that Craft Fantastic offers. 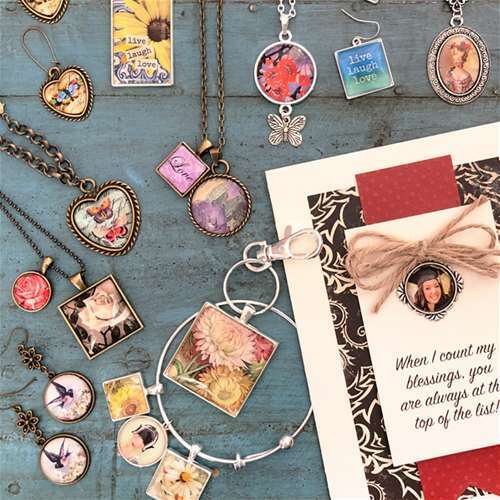 Use creative tips and tricks combined with Jeweler,s Glass, Fantastic Art Images and Fantastic Glaze & Glue to make amazing, heirloom-quality jewelry and embellishments. What products will be highlighted: All Craft Fantastic products. What will I learn or complete: 12+ projects. What do I need to bring to class: Scissors. What do I need to finish at home: None. What techniques will I learn or use: You will learn how to create glass cabochons and embellishments with Jeweler's Glass and Fantastic Glaze & Glue. Will I complete this project in class: Yes it is very likely you will finish the projects in class.